Mind on Movies has a copy of Pacific Rim to giveaway. 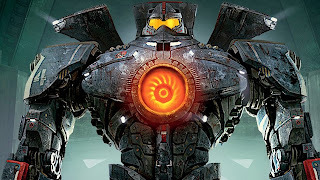 Pacific Rim is an epic science fiction film set in the 2020s. Earth is at war with Kaijus; colossal monsters from an inter-dimensional gateway on the Pacific Ocean floor. Humanity unites to fight these huge monsters by creating the Jaegers: gigantic humanoid robots that are controlled by two pilots whose minds and memories are linked.